The next movie in the Transformers Movie series will be: Transformers: Age of Extinction. The sequel will again be directed by Michael Bay and produced by Steven Spielberg, but the rest of the cast is different. According to /Film the title is a reference to the appearance of the fan favorite Dinobots. The Dinobots, unlike the other machines, transform into robot dinosaurs. It was established in the first Transformer movie that the robots take on the appearance of the dominant life-form, so we can assume they landed on Earth during the age of dinosaurs. When I was a kid we had a few of these. They are the absolute coolest toys in the entire Transformers toy line. While it hasn't been officially confirmed they'll appear, in an interview with Tformers.com, producer Lorenzo di Bonaventura said, "I can not disclose the specifics, but you can be sure that the arrival of the Dinobots will give the audience a lot to be excited about. The world's coolest, most exciting cars will appear in the film, including Chinese vehicles, so whether you are a car enthusiast or not, it will be a feast for the eyes." The Dinobot team is made up of team lead Grimlock (Tyrannosaurus Rex), Slag (Triceratops), Sludge (Apatosaurus), Snarl (Stegosaurus), Swoop (Pteranodon) and Paddles (Elasmosaurus). 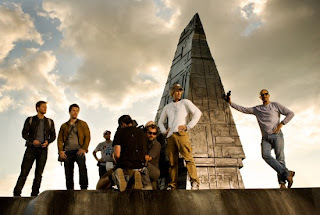 Michael Bay also released an unexplained teaser photo on his site for the film with the caption: "Pictured left to right: Jack Reynor; Mark Wahlberg; 2nd Assistant B-Camera Casey “Walrus” Howard; 1st Assistant B-Camera John Kairis with back to camera; B-camera Operator Lukasz Bielan; Director Michael Bay; and Director of Photography Amir Mokri." The Transformers movies are the fourth highest-grossing film (gross per film average) behind the The Lord of the Rings, Harry Potter, and Pirates of the Caribbean film series. So we can be sure we'll be getting a lot more of them in the coming years. Transformers: Age of Extinction is a sequel to Transformers: Dark of the Moon and will take place four years after the invasion of Chicago. Mark Wahlberg takes over the lead role from Shia LaBeouf and plays Cade "as a single father and struggling inventor." The movie is due for release in the US on the 27 June 2014. While we're not a Transformer movie blog, my love for the show means we'll be covering a lot more in the coming months. 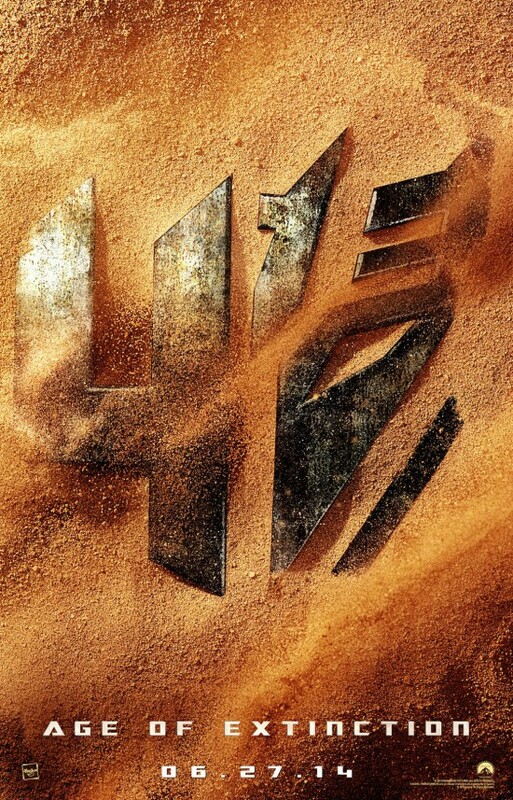 What do you think of the new title for Transformers 4? Well, the third one made over a billion dollars, so not surprised there will be a fourth. Not familiar with the toys as they came long after my time. The Dinobots were cool, though who the hell is "Paddles?" So I guess this means they're going with the comic book origin story of the Dinos. In the TV show they were made by Wheeljack and Sparkplug in present day by scanning some fossils. If I watch it I'll do like the 3rd one which was to rent it on DVD and then fast forward all the boring human parts to just get to the robots fighting. I mean that's all we really care about. I like the series, but I never liked Shia LaBeouf - the machines I love, replace him and it will make my favorites. Love the giants! The Dinobots and Insecticons were always my faves. I felt that the last half of Dark of the Moon was the way all the films should have been. Although I'm a fan of the toys, I haven't watched any of the Transformers movies but do think that this poster has a nice simplicity to it that works for the next installment. I mean, it gives you all of the necessary information such as the characters, the plot and the point where they're at in the franchise, all without having to cram lots of graphics and fancy photography into the movie poster. They'll keep making them till they stop making money Alex. I thought he did a good job in the first one, but by the third film his character was exactly the same and got annoying. Whether Wahlberg will be less annoying remains to be seen. Which is your favorite robot? Agreed David! The Inseticons were cool too. There has been an excessive use of Photoshop lately Nicole. The blowing sand implies something buried. Great analysis! Have you designed posters for your movies? Giant robot dinosaurs? Count me in too Nicki! Thanks. That blowing sand to reveal a buried "thing" that was once in existence definitely gives a nice face to the movie. I've only designed posters (and they were plain and cheesy...I used a lot of Photoshop too) for a few of my earlier works but I am trying to find a concept for the direction of the poster for my current movie, so that I can communicate those ideas to whoever is going to be designing the poster....'cause I won't be me, if I can help it, lol. I've enjoyed the fine art of drawing more than working with graphics on a computer. Needless to say...my storyboards look a lot better than any of the old poster designs IMHO....except for a Suzuki motorcycle ad that I did for one of my class assignments years ago....and to this day, I can't even find that file on my old zip drives. Speaking of posters, I'm working on a series about trends in the design that I will be posting soon that it based on the compilations of a guy whose been creating collages of posters for some time. You might like it or find it amusing, at least. I'm probably going to hold a contest for my "ABYSS" poster, so if you know any graphic designers, maybe they can submit something and to be used as the main graphic for the movie. If I do the contest, I'll be sure to send the announcement your way. I liked the pacing and the desperation that the last half seemed to have, compared to other movies. I prefer traditional media too, but you can't beat digital for speed. I might enter the contest myself but definitely email us when you're ready! The threat was definitely more powerful in that film. Especially with the traitor twist. The yellow car, he was so protective!